Based on all combinations of your variations, the system generates a final view of your page variations and highlights the set goals of each variation. You may switch among variations and check the set goals and added variations. You may include or exclude the page variation into or from the experiment. You may share the link of the particular variation with your teammates. You may always ask our experts or check our documentation if some questions appear. You may highlight the goals or changed elements of the selected variation. You may check the way each of your variation looks like on the desktop, tablet, or mobile screens. 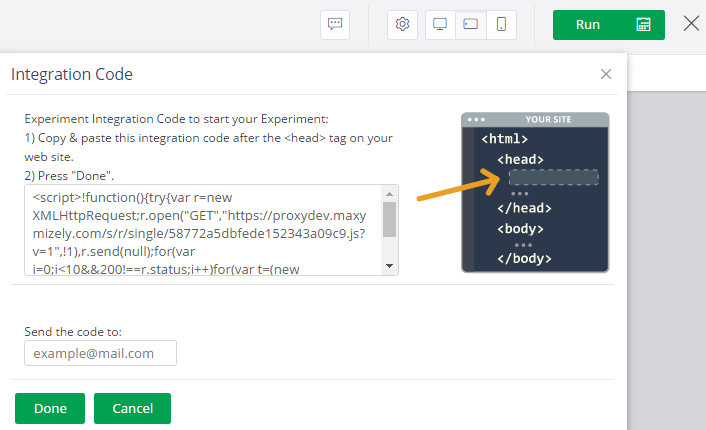 You may run the experiment by inserting the integration code as it is shown on the instruction when you are ready. 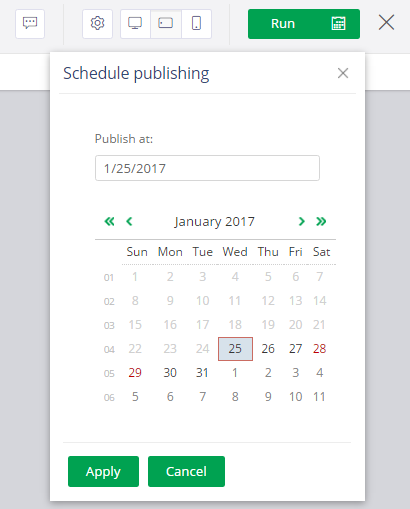 You may schedule the publishing if you have some particular milestones. At least one page variation must be included. If you don’t have Advanced user’s or Admin’s rights, you won’t be able to include/exclude page variations. If you have added segments, you have to include/exclude page variations in all created segments. After closing the experiment all your changes are saved.